Coordinates: 56°47′49″N 5°00′13″W﻿ / ﻿56.79685°N 5.003508°W﻿ / 56.79685; -5.003508 Ben Nevis (frae Scots Gaelic: Beinn Nibheis) is the heichest muntain in Scotland an in Gret Breetain as a hail. It ligs at the wastren end o the Grampian Muntains in the Lochaber aurie o the Hielands, naur the toun o Fort Wulliam. Lyk monie Scots muntains, it is aften kent baith ti locals an veisitors as sempilie the Ben, whilk cums frae the Gaelic beinn meinin "muntain". Thar ar an estimatit 100,000 sklims o Ben Nevis ilk yeir, aboot thrie-fowerts o whilk ar made bruikin the weil-biggit Pownie Pad frae Glen Nevis on the sooth syd o the muntain. For sklimmers an muntaineers the main draw is the 700 m (2,300 ft) hie clints o the north syd. Thir ar amang the heichest clints in the Unitit Kinrick. At the summit, 1344 m (4,409 ft) abuin sie levil, ligs the huil o an auld observatorie that wis aye staff'd atwein 1883 an 1904. The meteorological data gethert durin this stound is yit wechtie for unnerstaunin Scots muntain wather. C. T. R. Wilson wis inspyr'd ti mak the clud chaumer eftir a speil spent wirkin at the observatorie. The first recorded sklim o Ben Nevis wis made on 17 August 1771 bi James Robertson, an Edinburgh botanist, wha wis in the aurie ti gether botanical swatches. Anither aerlie sklim wis in 1774 bi John Williams, wha wrat the first acount o the muntain's geological makup. Inglis makar John Keats sklim'd the muntain in 1818, lykenin the sklim ti "mounting ten St Pauls without the convenience of a staircase". It wis no till 1847 that Ben Nevis wis confirm'd bi the Ordnance Survey as the heichest muntain in Breetain an Ireland, aheid o its rival Ben Macdui. The summit observatorie wis biggit in the simmer o 1883, an wad stey runnin for 21 yeirs. The first pad til the summit wis biggit at the same tym as the observatorie an wis schamed ti lat pownies cairrie up supplies, wi a maximum gradient o ane in five. The apenin o the pad an the observatorie eikit the popularitie o sklimin the Ben, whilk becam e'en mair popular eftir the Wast Hieland Railwey wun ti Fort Wulliam in 1894. Aboot this tym the first o several owertures wis made for a rack railwey til the summit; nane o whilk cam ti be. In 2000, the Ben Nevis Estate, inhaudin aw o the sooth syd o the muntain an the summit, wis bocht bi the Scots hainin chairitie the John Muir Trust. The Ben Nevis Distilerie is a singil maut whiskie distilerie at the fuit o the muntain, bydin bi Victoria Brig til the north o Fort Wulliam. Foondit in 1825 bi John McDonald (kent as "Lang John"), it is ane o the auldest leesenst distileries in Scotland, an is a popular veisitor steid in the aurie. The wattir bruikit ti mak the whiskie cums frae the Allt a' Mhuilinn; the burn that flowes frae Ben Nevis's northren corrie. ↑ "Ben Nevis, or the 'Ben' as it is fondly known locally". Visit Fort William Ltd. Retrieved 2007-10-23. 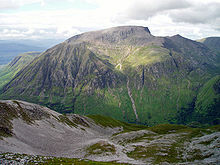 ↑ "Ben Nevis is almost always referred to by climbers as simply The Ben (Ben meaning Mountain)". The Ben Nevis Challenge. Retrieved 2007-10-23. ↑ The Nevis Working Party (2001). "Nevis Strategy" (PDF). Retrieved 2006-11-05. ↑ Suzanne Miller (2004). "Ben Nevis Geology". The Edinburgh Geologist 43: 3–9. ↑ Marjorie Roy (2004). "The Ben Nevis Meteorological Observatory 1883-1904" (PDF). International Commission on History of Meteorology. Retrieved 2006-11-27. ↑ "Ben Nevis Distillery". Retrieved 2006-11-25. ↑ "Ben Nevis". Edinburgh Malt Whisky Tour. Retrieved 2006-11-25. ↑ "Ben Nevis Distillery". Scotchwhisky.net. Retrieved 2006-11-25. Wikimedia Commons haes media relatit tae Ben Nevis.